Wellness Warriors challenge: BAH KHO-JE Restoration – UNITY, Inc. The Iowa Tribe of Oklahoma’s newly formed Youth Council completed their UNITY Wellness Warrior’s Community Service Project named BAH KHO-JE Restoration this year. The youth spent one day making traditional footballs out of Elk Skin, taught to them by an Elder in the tribe. The next day they had a day of Indian Football we call Tawe Thi. There was healthy food and education booths at the registration for the event. After booth participation, the tribe’s Business Council Person and UNITY Co-Advisor, Eagle McClellan, came said a few words of support and offered a blessing over the food and event. A healthy breakfast of bananas and peanut butter was served before the first game. Played in the traditional way of the homemade ball being rolled into the field between the two teams, guys were able to kick and throw the ball while the girls on each team could also pick the ball up and run with it while in their possession. It didn’t take long before strategies and plans were made to get that ball across the goal lines, even once a team picking up a girl player and carrying her across the goal line, which is traditionally permitted. The teams played in a grassy field on tribal lands with their UNITY flag waving over the games. Both youth and audience were really able to gain the feel of the traditional way this game was played in past generations on the open plains. Each game scoring 10 goals for the winning team lasted about an hour and 15min, offering a hydration break when one team reached 5 goals. Between the morning and afternoon games there was a healthy lunch of salads an d proteins offered to all youth, parents, and public present. Lots of physical activity and health promoted in a traditional way made for a great project. We had 20 Native youth in participation and approximately 10 adults from the Iowa tribal community. The BAH KHO-JE Restoration project was all youth created, led, and operated as each UNITY member took turns being the referees and staff of the event. Youth Council Advisor Regina Riley reported back to the UNITY staff that “the youth are excited to share their event progress and are thankful they learned project development at the Mid-year conference in January 2018. The training helped them facilitate an effective project!” Advisors who attended the 2018 National Conference in San Diego also reviewed the Project Planning toolkit during their Advisor Training with lead facilitator Pearl Yellowman. UNITY Wellness Warriors challenges the 200+ affiliated Youth Councils to plan and implement a Wellness Warrior event of their own this upcoming year. 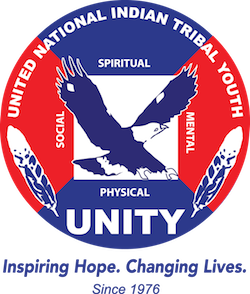 By utilizing the project planning tools offered through the free mobile phone app and on the UNITY website, youth councils can join the national movement and share traditional wellness teachings with their home community.